There was a time, not that long ago, when a snow-filled winter would have banished most ATVs and UTVs to the garage until spring. 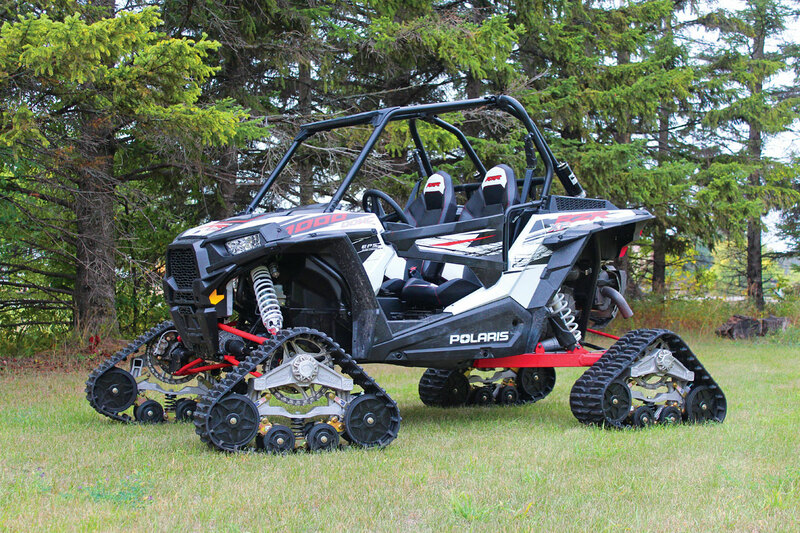 But a few years back, snowmobile technology started finding its way into the ATV market, and rubber-tracked kits were developed that directly replaced the wheels on our ATVs and UTVs for winter. These initial ATV “snow” track kits were pretty darn cool, but they were expensive and extremely heavy. And since rotating weight is the number one killer of horsepower, overall performance suffered. But, today, better materials, technology and components have brought performance and durability to a whole new level. As the Mattracks story goes, the entire company is the result of the founder’s 11-year-old son drawing a large truck with tracks instead of tires and asking his dad, “Could we make something like this?” That question led to a few years of engineering, a patent and a 1994 release to the public. 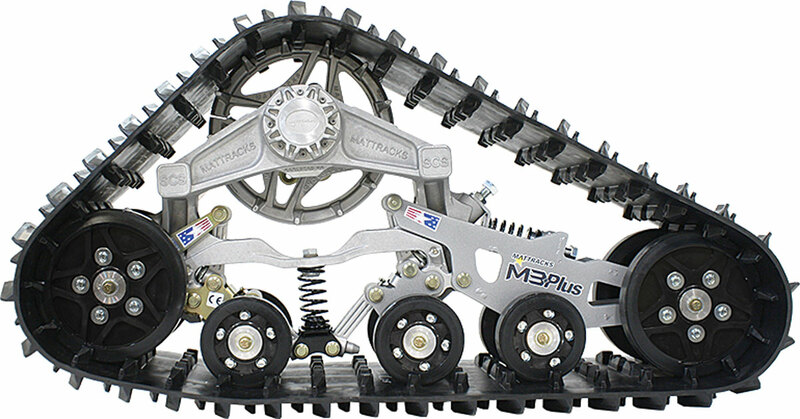 Mattracks have since been sold on every continent and in over 100 countries. The M3 Litefoot features aggressive 1 3/4-inch-deep paddle lugs on a wide track for greater traction and flotation on soft terrain. 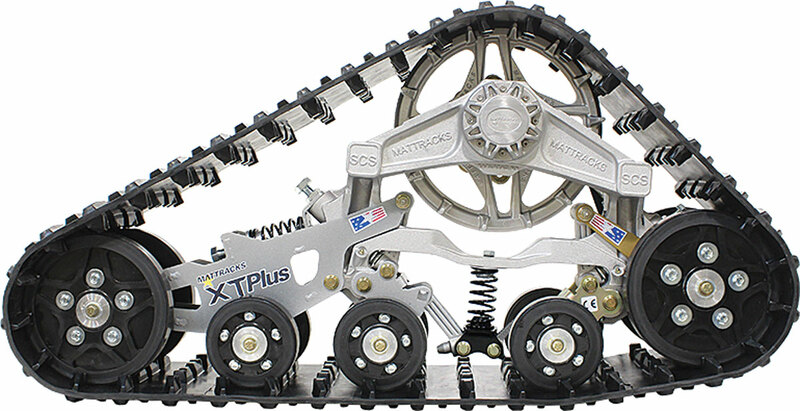 The 13-inch-wide, extra-long track uses a patented, four-link Shape Changing suspension. 6X6 Series The 6×6 series is designed exclusively for Polaris’ high load-capacity 6×6 ATVs and UTVs. They feature a versatile, aggressive, utility-rated tread with a rubber-torsion antitorque system. The 6×6 series is designed exclusively for Polaris’ highload-capacity 6×6 ATVs and UTVs. 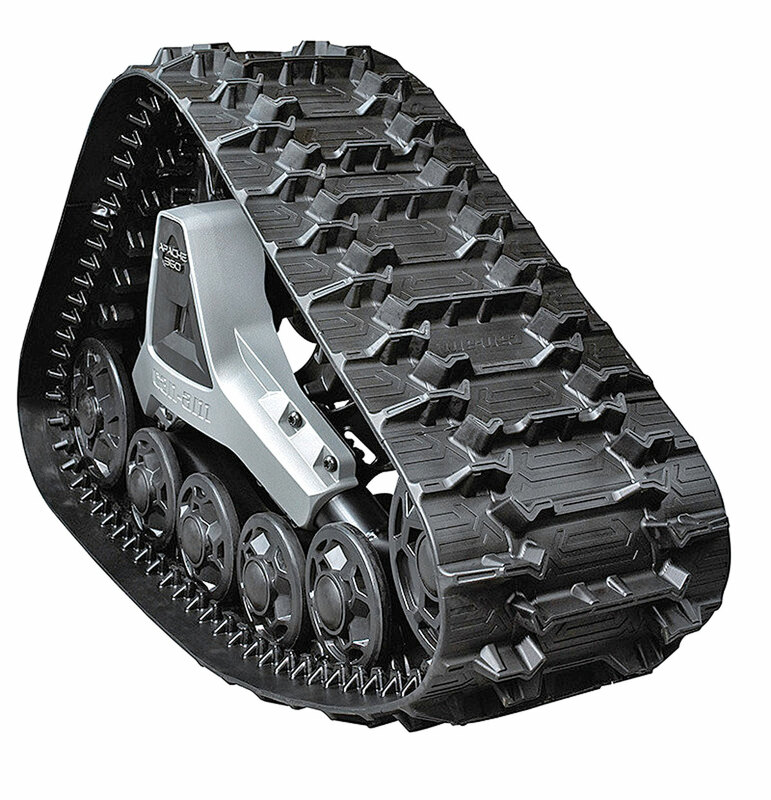 They feature a versatile, aggressive, utility-rated tread with a rubber-torsion antitorque system. 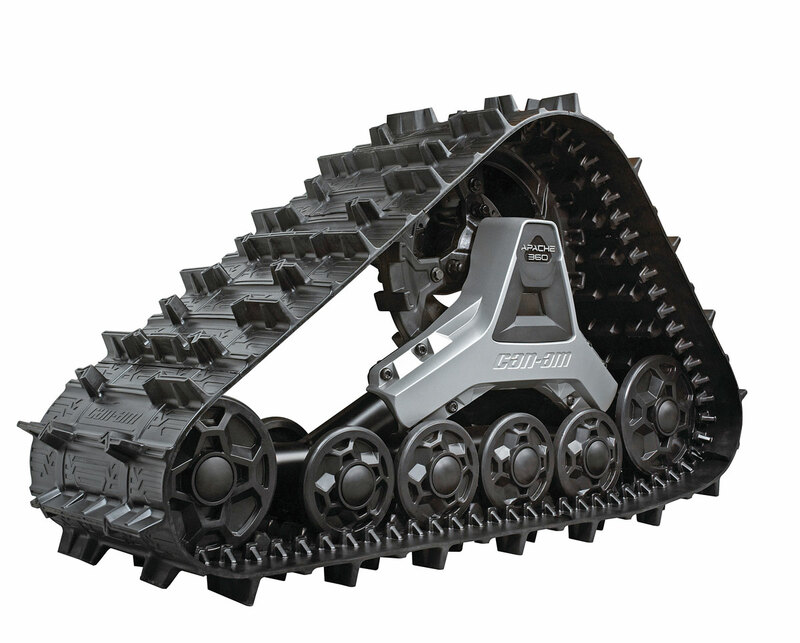 The EZ ATV and EZ UTV are the Litefoot Plus platforms that extend the ground contact area, adding up to 30 percent more rubber track. 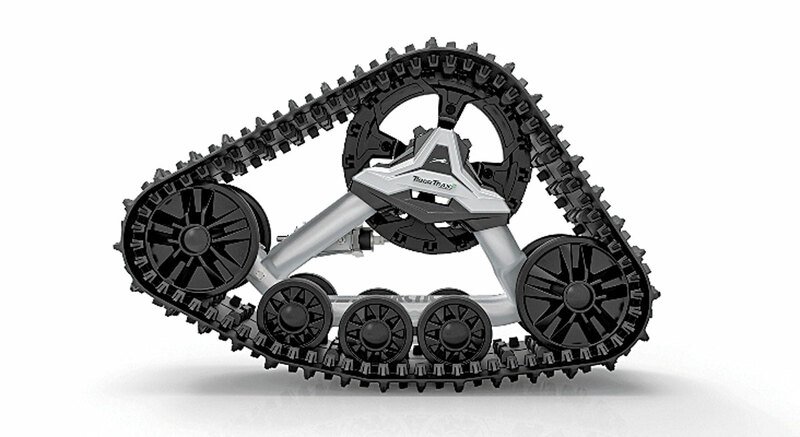 Greater flotation and better traction provide superior mobility in deep snow and on steep climbs with Mattracks’ patented Shape Changing suspension. The EZ ATV works for up to 2500 pounds GVW, and the EZ UTV is rated to an impressive 3500 pounds GVW. The Camso Company is a merger between two well respected companies in the track industry. Camoplast and Solideal products are now both available under the Camso name, and their impressive R&D findings, patents and technologies can be used together to build superior equipment. Available for machines as small as 300cc on up to 1000cc monsters, the T4S fits 99 percent of all vehicle models and claims to be the lightest system in its category. The front flex-track technology offers stability, control and a genuine wheel-like feel. 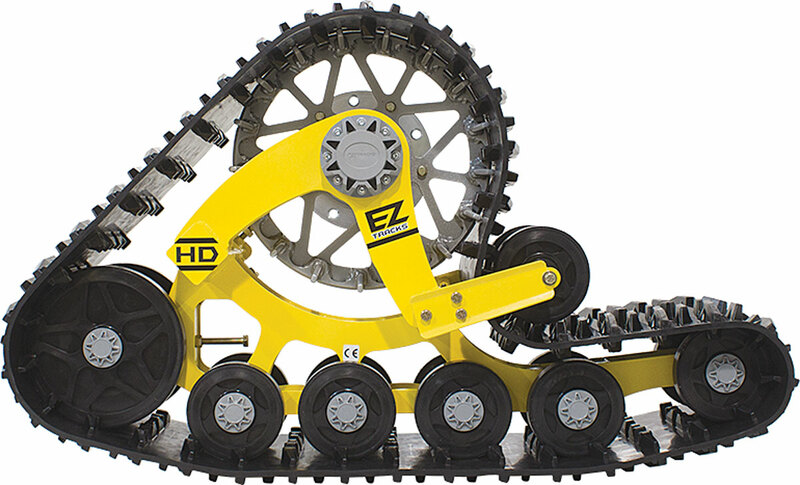 The kit is designed for a fast, easy swap from wheels to tracks and back again. 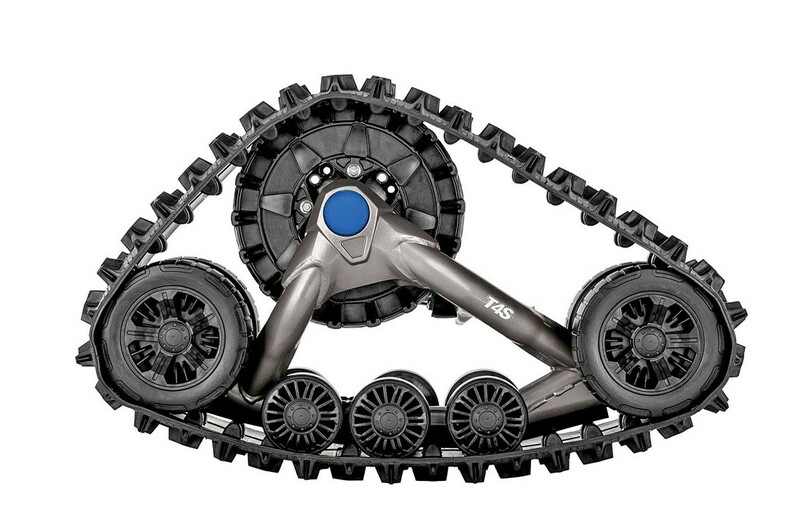 The T4S UTV track system is specifically designed for larger, high-powered, side-by-side machines looking to tackle deep snow, swamps, marshes and mud. 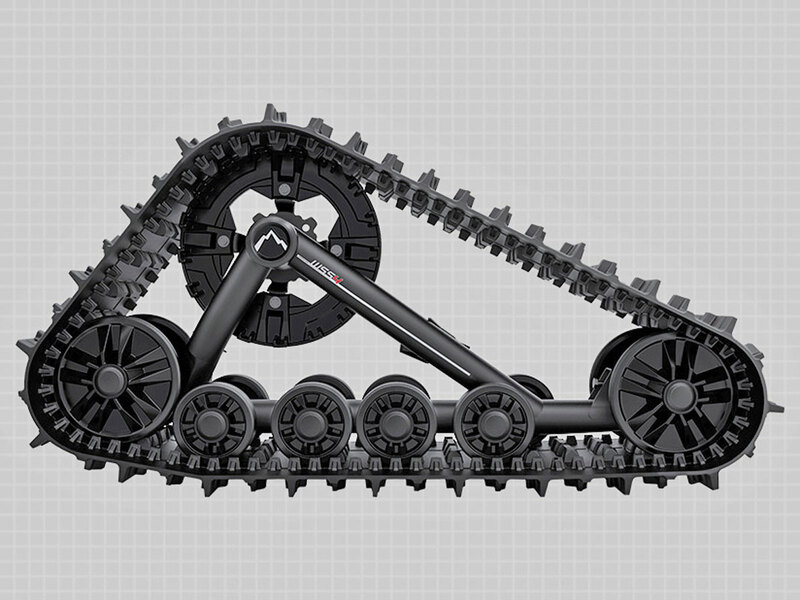 It features longer and wider tracks to accommodate the greater weight and preserve vehicle load capacity. 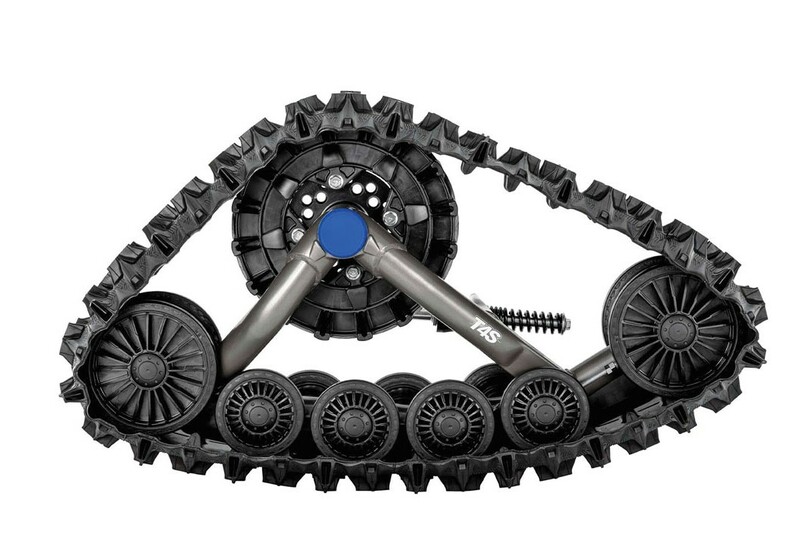 The TS4 UTV kit uses puncture-proof inner tires and is geared specifically to your machine. The UTV models feature a 14-inch-wide rear track for improved flotation, increased miles per gallon and better hill-climbing capabilities. The new WS4 kit uses a unique configuration that eliminates sliders for amazing efficiency on all types of terrain and in all conditions. Reduced friction and rolling resistance translate into steady performance that keeps going with low maintenance and limited wear. 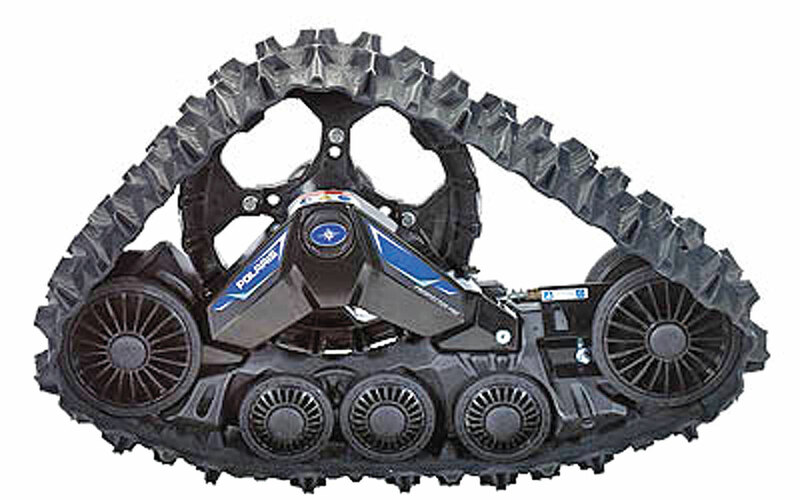 The WS4 features a large, aggressive track profile for maximum flotation, and claims an additional inch of ground clearance over the competition. 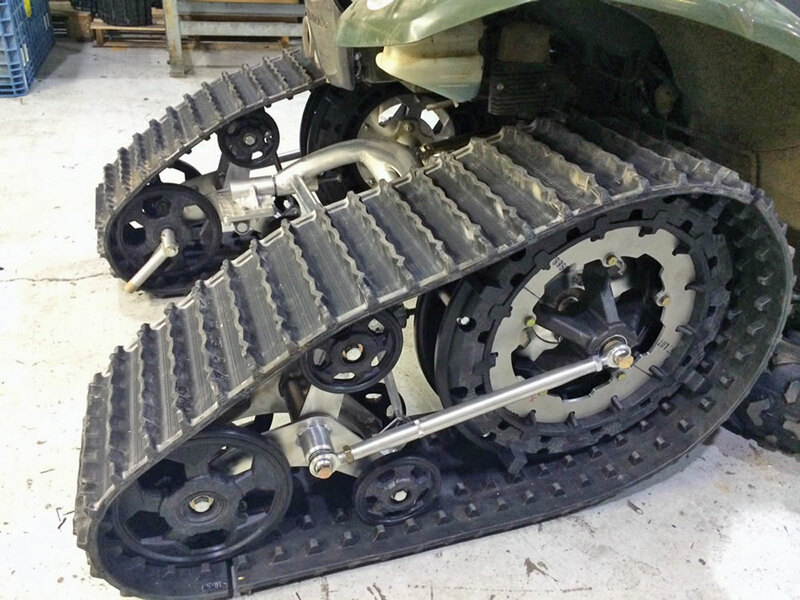 KTracks makes snow-track conversion kits for almost every UTV and ATV. Where KTracks really differentiates itself from the rest of the market is with its two-wheel-drive sportquad setup. The KTracks kits use a 10-inch-wide carbide front ski in place of the front wheels and then converts the rear swingarm into a dual-tracked, snowmobile-type setup. KTracks also uses a non-gear-reduced setup to allow maximum top speed, claiming to maintain 95 percent of your ATV’s performance. The KTracks system also claims zero failures for the past seven years of production. OEMs like Polaris, Can-Am and Arctic Cat have jumped on the track-system bandwagon. While quality appears to be great with many of the aftermarket brands, one key advantage to an OEM-manufactured kit might be financing. With track kits hovering around the $4000 mark, a lot can be said for adding them into the deal when financing a new machine. Polaris-manufactured Prospector Pro track systems are designed, engineered and built specifically for Polaris ATVs and UTVs. They are said to deliver the utmost in performance and productivity, with no compromise of vehicle cargo capacity or pulling power. The Prospector Pro uses triangular geometry for optimized weight distribution with a massive surface area for reduced down pressure. Triple-sealed main bearings and an oilbath housing provide superior load ratings and longer life expectancy. The rubber tracks are engineered for superior traction with minimal deflection for easy steering and the utmost in performance and comfort. Claimed to be the best year-round kit on the planet, the Apache 360 provides a massive contact patch and ground clearance, with a quick 20-minute installation time. The kit fits the Outlander, L Max, Outlander L, Outlander Max, Renegade 800 and 1000. Developed from the same technology as the Apache 360, the 360 LT features two settings for a better attack 360, the 360 LT features two settings for a better attack angle or better overall flotation. The LT also offers an even larger contact patch by 15 square inches up front and 41 square inches in the rear. The kit will fit the Outlander, 2013+ Renegade, Commanders, Mavericks and Defender.